I'm starting to scrap the park pics from our June Disney trip, starting out with a photo from Epcot (taken by a Photo Pass photographer). I had a lot of fun using the chipboard pieces from Little Yellow Bicycle's Escape collection on here to create a little ensemble in the bottom left using the suitcases and passport. I also took the fabric banner apart (it said "are we there yet?" and used three of the pieces to spell out "we are there" at the top of the photo. This was the first time I used one of the 5 Things pockets on a page and I will definitely be using more. They are the perfect place to store journaling, memorabilia, etc. I lined the inside of the pocket with patterned paper, tucked in a journaling card and then attached a banner flag to Alexa's park pass and tucked that in there too. Wonderful layout! Have a great weekend! You are simply AMAZING!! I loveeeeeeeeeeee this!! LOVE LOVE LOVE the colors, the photo, the little flags!! You sooooo inspire me on how AWESOME all your embellies are on every project!!!! GORGEOUS!!! Very cute layout! So many wonderful details on this! This is just so much fun. Love the colors and layers. Such a great travel layout! 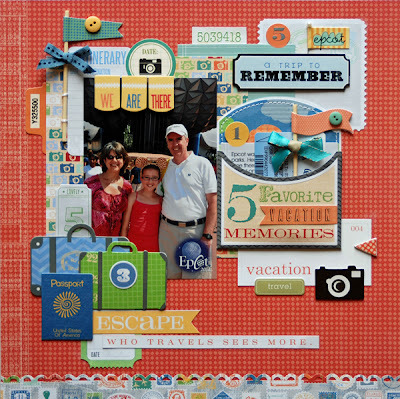 Love your layering Lisa and the colors are super fun! Fun layout! Love these colours and all of the layering and fun little extras tucked in. OMGosh, I love all the embellishments on this one!! Very cute Lisa!! This is a fabulous layout. I love all the papers and bits and pieces. The Colors are perfect! Cool sticker too. This is FAB and I LOVE what you did with the pocket, adding the pp and the bits of stitching. Really fun. Great pic too. Those suitcases are so great Lisa! I like to disassemble embellishments too!